Acromioplasty is a surgical procedure that involves acromion. The acromion is the outward end of the shoulder blade. The reason for having Acromioplasty is to remove a part of acromion from the shoulder. The Acromioplasty surgery is done to the fact that the outward end of the shoulder blade that is also called acromion gets in contact with the tendons. As a result, there is friction caused by the attachment. The attachment is removed by removing the piece of the bone from the shoulder. The Acromioplasty is adopted in order to save the tendon from the damage that is done by the acromion. Acromioplasty is basically a type of surgery that is also called subacromial decompression. In subacromial decompression, the acromion bone is removed partially from the shoulder so that the friction between the bone and the tendon can be removed. The acromion is a shoulder bone that is extended to the shoulder joint. There is an acromioclavicular joint that is formed along with the collarbone. As soon as there is movement in the shoulder, the scapular spine gets damaged. The bone actually gets rubbed with the tendon. In order to prevent the tendon from getting damaged due to consistent movement, the Acromioplasty is done. The Acromioplasty Surgery is done to make it sure that the patient gets relief from pain. To ease the patient from the pain the shoulder is shaved a bit. The surface of the acromion is slightly removed in order to keep the space for the movement without having any contact with the tendons. 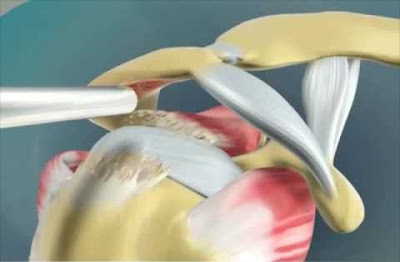 The Acromioplasty Surgery use arthroscopic technique, in this technique arthroscope is used to perform such kind of surgery. The use of arthroscope is to have the inner view of the shoulder during the surgery. The incision is made to detach the fibers. The precise size of the acromion is also reduced. The Acromioplasty Recovery is dependent upon the type of the surgery. Commonly the patient having Acromioplasty surgery can recover fast. In surgery there are slings used, the rate of recovery is very high. Whereas, if there is an invasive surgery done then it can take around six weeks to get complete recovery. After the surgery, the patient is advised to have the rest. The movement of the shoulder should be limited during the first few weeks. After the first week, the shoulder can gain the required strength. In an open surgery, the patient has to wait for a year to get the full recovery of the shoulder. The rehabilitation of the Acromioplasty is based upon the amount of ease that is given to the shoulder by the patient. The patients after the surgery are not allowed to move the shoulder until unless it is advised by the doctor. Afterward, the slow movement of the shoulder can be started with the recommendation of the doctors. To speed up the recovery, the factor of shoulder movement is considered as the top priority. The physiotherapy is recommended to the patient that is done in three phases. The rehabilitation program designed to give relief to the patient can extend up to two weeks. There are some exercises that are advised to the patients.